Everyone who eats these little cakes loves them! Brown sugar gives them a rich, warm flavor reminiscent of maple syrup, and cornmeal adds a pleasantly grainy, chewy texture. A small amount of lemon extract and lemon zest lift the overall flavor. Because these are larger than most bite-size desserts, each cake can easily serve two. Position a rack in the center of the oven and preheat the oven to 325 degrees. Spray the cavities of the pan with nonstick baking spray and place the pan on a baking sheet. Beat the butter in the bowl of an electric stand mixer or in a large mixing bowl using the flat beater attachment or a hand-held mixer on medium speed until it’s fluffy, about 2 minutes. Add the brown sugar and beat together well. Use a fork to lightly beat the eggs and egg yolk together in a small bowl. Add to the butter mixture a tablespoon at a time. Stop and scrape down the bottom and sides of the bowl with a rubber spatula a couple of times to help mix evenly. The mixture may look curdled, but as you scrape down the bowl, it will smooth out. In a medium-size bowl, mix together the flour, cornmeal, and salt. Add to the butter mixture in 3 stages, mixing thoroughly after each addition. Add the lemon and vanilla extracts and the lemon zest and mix thoroughly. Use a spoon or a 1½-inch ice-cream scoop to evenly divide the cake batter among the cavities in the pan. Bake the cakes for 30 minutes, until golden and a cake tester inserted in the center comes out with no crumbs clinging to it. Remove the baking sheet from the oven and transfer the pan to a rack to cool completely. Invert the pan to remove the cakes. Whip the cream in the chilled bowl of an electric stand mixer with the wire whip attachment or in a large a mixing bowl using a hand-held mixer on medium speed until frothy. Add the honey and continue to whip until the cream holds soft peaks. Fit a 12-inch pastry bag with a large open star tip and fill it partway with the whipped cream. Pipe a rosette of cream in the center indentation of each cake. 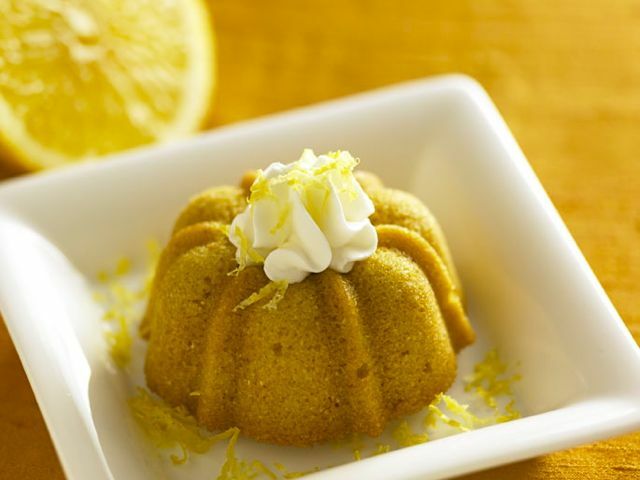 Sprinkle the finely grated zest of 1 lemon over the top of the cream on each cake. Store the cakes without the whipped cream between layers of waxed paper in an airtight container at room temperature up to 3 days. To freeze up to 3 months, wrap the container snugly in several layers of aluminum foil and plastic wrap. Use a large piece of masking tape and an indelible marker to label and date the contents. If frozen, defrost the cakes overnight in the refrigerator.